Ian McCulloch Interviewed by Laura Davis of The Liverpool Daily Post. 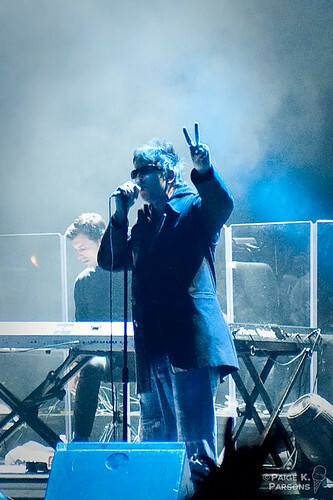 Like all good rock stars, Ian McCulloch knows how to make an entrance. The Echo and The Bunnymen frontman is 20 minutes late and counting. Considering he only has to come down a few floors from his room to meet me in the hotel bar, it’s almost impressive. When the singer finally does decide to come down to the hotel lobby, he doesn’t disappoint. McCulloch is in his stage attire – jeans and green military jacket, with his hair artfully dishevelled. It goes without saying that he’s wearing shades. He always wears shades. So used are we to seeing the 51-year-old in sunglasses, when he takes them off at one point to rub his eye, he’s virtually unrecognisable. “I didn’t know he was here as well,” he says upon shaking hands, gesturing toward the giant etched leather image of John Lennon hanging on the foyer wall, like one Scouse sage acknowledging another. Mac, as he’s known, doesn’t want to do the interview straight away, he wants to chat first to feel comfortable, and after a couple of drinks, a few anecdotes (“The last time I was in this hotel was when we were filming the video for the 1998 World Cup song”) and a compliment (“You’ve got a lovely demeanour,” he says, sweetly) we begin. He’s here to talk about Crocodiles and Heaven Up Here, the first two albums by his post-punk band Echo & The Bunnymen. Released in 1980 and 1981 respectively, they were critically lauded at the time, and are now rightly regarded as classics. The tour follows on from last year’s shows where the band performed their 1984 landmark album Ocean Rain in its entirety. “I don’t see this as nostalgia, it’s something we’ve not really done before last year’s Ocean Rain shows. I just don’t think there are many bands who you’d go to see do their first two albums. Joy Division, yes, but they obviously can’t, and maybe Talking Heads if they were still that left-field art band. McCulloch puts his darker feelings down to the Liverpool house he grew up in. He paints a detailed picture of his family: his dad, silent, in one room, his mother looking after Ian and his siblings in another. “There was a thick air of melancholy in the house; always a joke, always a laugh after everything, but me mum and dad’s relationship broke down, my half-brother died when he was 19 and that stayed in the house. A short video of the band’s soundcheck @ Radio City Music Hall on October 1st, 2008. The song is Crystal Days.